Investors in Fannie Mae and Freddie Mac face massive losses when trading opens Monday. NEW YORK (Fortune) -- Big investors in Fannie Mae and Freddie Mac face a brutal Monday. Shares in the mortgage giants, which have already lost 90% of their value over the past year, are likely to plunge anew in the wake of the government's announcement Sunday that it is taking control of the companies and ending the payment of common and preferred dividends. Common and preferred shareholders won't be outright eliminated, as some had feared. But while the shares will continue to trade, it may for investors be a distinction without much of a difference. 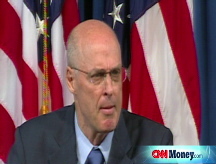 Under the "conservatorship" plan announced Sunday by Treasury Secretary Henry Paulson, common shareholders will also be stripped of their rights to govern the companies. Given that both Fannie (FNM, Fortune 500) and Freddie (FRE, Fortune 500) have posted billions of dollars in losses during the past year, and that billions more are expected while house prices continue their historic decline, it's not likely that the market will accord much value to shares that give holders no right to select board members or otherwise oversee management. Bill Miller, the Legg Mason mutual fund manager, was Freddie Mac's largest shareholder as of July 31, with 12% of the company's stock. Others Freddie investors include Capital Research & Management of Los Angeles, with a 10% stake as of June 30, and AllianceBernstein and Pzena Investment Management, both of New York, with 6% and 5%. Holders of Fannie common shares include AllianceBernstein, with 12% of outstanding shares, and Capital Research and Dodge & Cox, of San Francisco, each with 11%, according to data from LionShares.com. The government said it will recapitalize Fannie and Freddie over time by making purchases of senior preferred stock. The existing preferred shares will continue to trade, the government said, inflicting losses most notably on the regional banks that hold them. Treasury said banks should ask their regulators for help if they believe losses on Fannie-Freddie holdings cause their capital to fall below required levels - an admission that the prices of the existing preferred shares are likely to fall even from their already reduced levels. "The federal banking agencies are assessing the exposures of banks and thrifts to Fannie Mae and Freddie Mac," Paulson said. "The agencies encourage depository institutions to contact their primary federal regulator if they believe that losses...are likely to reduce their regulatory capital below "well capitalized." The prospect of a virtual wipeout of existing Fannie and Freddie preferred shares could lead to declines Monday in the shares of regional banks and major insurers that hold the shares. Among the holders of Fannie and Freddie preferred issues are Genworth Financial (GNW, Fortune 500) and MetLife (MET, Fortune 500). The government intervention comes just over a month after Legg Mason's Miller reported a sizeable purchase of Freddie shares. Miller came to fame with a 15-year run of beating the S&P 500. But that streak ended in 2006, and since then his Legg Mason Value Trust has lagged far behind the market. Miller's run of poor results hasn't made him any less aggressive, however. He has owned Freddie shares for some time but has been doubling down on the company as its shares plunged over the past year. Legg Mason owned 15 million shares at the end of 2007, when Freddie stock was fetching $34 a share in the market. He then boosted that figure to 50 million in the first quarter, as shares dropped into the teens in the wake of the collapse of Bear Stearns, and 80 million at July 31, when the price was below $10. If the outlook for Freddie shares - which closed Friday at $5.10 but traded as low as $3.50 in the after-hours session when news of the Treasury plan began to circulate - is bleak, one ray of hope comes from the March collapse of Bear Stearns. Those shares were to be sold to J.P. Morgan Chase at $2 apiece in a Fed-brokered rescue of Bear, but the shares traded sharply above that level for a week, until the deal was renegotiated at $10. While shareholders in Fannie and Freddie appear to lack the leverage that Bear shareholders had - Bear holders had to approve the sale, after all, whereas Fannie and Freddie investors have been stripped of any governance rights - you can never quite know how the stock market's going to react in the short-term.